October 11, 2016 — Teledyne Optech is pleased to announce a high-performance scanner update to its innovative line of airborne laser terrain mappers, the Optech Galaxy ALTM™. The Galaxy’s scan efficiency has been engineered to deliver an additional 30% boost to its class-leading area coverage rates. When coupled with its innovative SwathTRAK™ and PulseTRAK™ technologies, collection efficiencies exceeding 70% are possible, relative to the traditional fixed-FOV dual-beam sensors currently on the market. The Galaxy is a giant leap forward in productivity and technology innovation that truly raises the bar in wide-area sensor performance. Central to the Galaxy‘s performance capability is a series of unique technology innovations and high-productivity feature sets that include SwathTRAK™ and PulseTRAK™. SwathTRAK™ leverages a programmable galvanometric scanner by dynamically adjusting the scan FOV during flight and data acquisition, enabling fixed-width data swaths even in variable terrain. The advantage: fewer flight lines and more consistent point distribution, whether on hill peaks or valley bottoms, compared to traditional fixed-FOV sensors. PulseTRAK™ enables a truly continuous operating envelope, thereby solving the multipulse challenge of data coverage gaps and density variation in the multipulse transition/blind zones. This gives surveyors the ability to use very high laser pulse rates and generate high point density in variable terrain, without the need for complex flight planning. Boasting the same ultra-compact form factor as the award-winning ALTM™ Orion sensor platform for tier 2 UAV, heli-pod, gyro-stabilized or fixed-platform installations, the Galaxy also maintains the same exceptional survey-grade data precision and accuracy for the highest quality data sets in the industry. 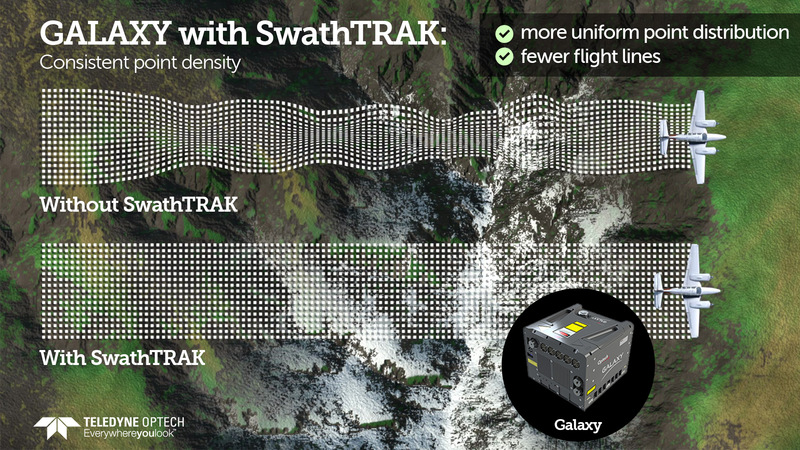 Whether it is high-altitude, wide-area mountain surveys above 4000 m AGL, or low-altitude corridor mapping initiatives, the Galaxy‘s superior dynamic range and exceptional small-target detection provides maximum application flexibility with no compromises in collection efficiency or data quality. The Galaxy’s high-efficiency performance capability will be showcased at this year’s INTERGEO Conference (Teledyne Optech booth A4.002 in hall A4). You can also access Galaxy data sheets and application primers on our website.